Canada, Mexico and the United States are cooperating to protect and conserve the monarch butterfly, which environment ministers of the three countries say has become a symbol of North America's shared environment. Each year millions of monarch butterflies migrate thousands of miles back and forth from wintering grounds in Mexico to their breeding locations in the eastern United States and Canada. In the fall, the orange and black monarchs return to just 12 forested mountaintops in central Mexico, where they form colonies in which millions of butterflies cluster on the trunks and branches of the trees. Despite the creation of protected areas and reserves, illegal logging has been shrinking this unique, critical monarch habitat. Although the monarch butterfly, Danaus plexippus, is not in danger of extinction, its unique multigenerational migration spanning the continent is considered an endangered biological phenomenon. Monarchs have up to four generations each summer, each one traveling a little further north than the last. The last generation of the year migrates south. Because monarchs depend upon a wide range of habitats in Canada, Mexico and the United States, conservation of the migratory monarchs requires trilateral cooperation due to threats to the butterflies' habitats throughout the flyway. The North American Monarch Conservation Plan, announced Thursday by the environment ministers of the three countries at their meeting in Ottawa, outlines concerted actions to be taken in each country. 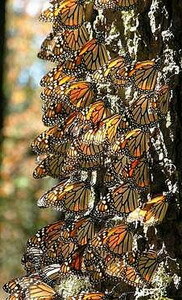 At their 2007 annual meeting, the ministers instructed the Commission for Environmental Cooperation, CEC, to develop a North American plan aimed at maintaining healthy monarch populations and habitats throughout the migratory flyway, while promoting sustainable local livelihoods in the wintering grounds in Mexico. Based in Montreal, the CEC is an international organization created by the three countries under an environmental side agreement to the North American Free Trade Agreement. The CEC monarch butterfly conservation plan outlines a long-term collaborative agenda with nearly 60 specific actions. It is aimed decreasing or eliminating deforestation in the overwintering habitat in south-central Mexico and California. The monarch conservation plan, in addition to the actions it outlines, provides a detailed overview of the monarch's migratory patterns, lifecycle and its current status. The plan also identifies the main threats to the monarch set in the context of current management actions taken in each country, as well as public perception of the species. This spring scientists identified severe degradation of the forest habitat within the Monarch Butterfly Biosphere Reserve in central Mexico, using imagery from the commercial Ikonos satellite. By comparing satellite images from 2004 forward to the present, monarch butterfly specialists Lincoln Brower, Daniel Slayback, and Isabel Ramirez have determined that 450 hectares (1,110 acres) of forest were logged between 2004 and 2008, representing 3.3 percent of the 13,552 hectares (33,410 acres) core zone of the reserve. Based upon the degradation apparent in these images, it is unlikely monarchs will form overwintering colonies at this Lomas de Aparicio site in future years, the scientists say. If they do return, they will be subject to much greater environmental risks during their six-month overwintering stay. An intact forest canopy serves a critical role by protecting the monarchs from both freezing cold during winter storms and from excessive warmth during the days. The researchers are concerned that the entire monarch butterfly migration and overwintering phenomenon in eastern North America may collapse in the near future if the Mexican government does not fully enforce the logging ban.